The Samoan Islands are smack dab in the middle of the Pacific Ocean, so pretty much everything but coconuts and bananas have to be shipped in from off-island. So when homesickness kicks in, the only thing to do is to resort to mail order. And while dealing with the post office is rarely ever a pleasure, mail order in Samoa has a whole host of interesting issues. As I mentioned in a previous post, the streets in American Samoa have no names. Nor do they have addresses or mail delivery. With no addresses on-island, you have to get a PO Box. Or at least have access to one. (Many people I knew got their mail through their employer’s PO Box.) As for UPS and FedEx, you were pretty much SOL. It was the postal service or a cargo container. Even after selling off 90% of our belongings at an auction and storing another 5% in a storage locker, we still had 5% of our stuff to ship. And because it was going halfway across the world, we had to wrap everything well and take the boxes to the Post Office in batches. The clerks there ranged from godawful to somewhat helpful, but none of them had a clue on how to send a package to American Samoa. (Why would they, after all?) Half of the clerks told us to use the green customs forms, while the other half told us to use the white. Once I had a clerk refuse to use a customs form at all. To this day, I don’t know the proper procedure. After living in American Samoa for a while, I started to get homesick. Thankfully, I had occasional Internet access, so I went online to order some stuff. 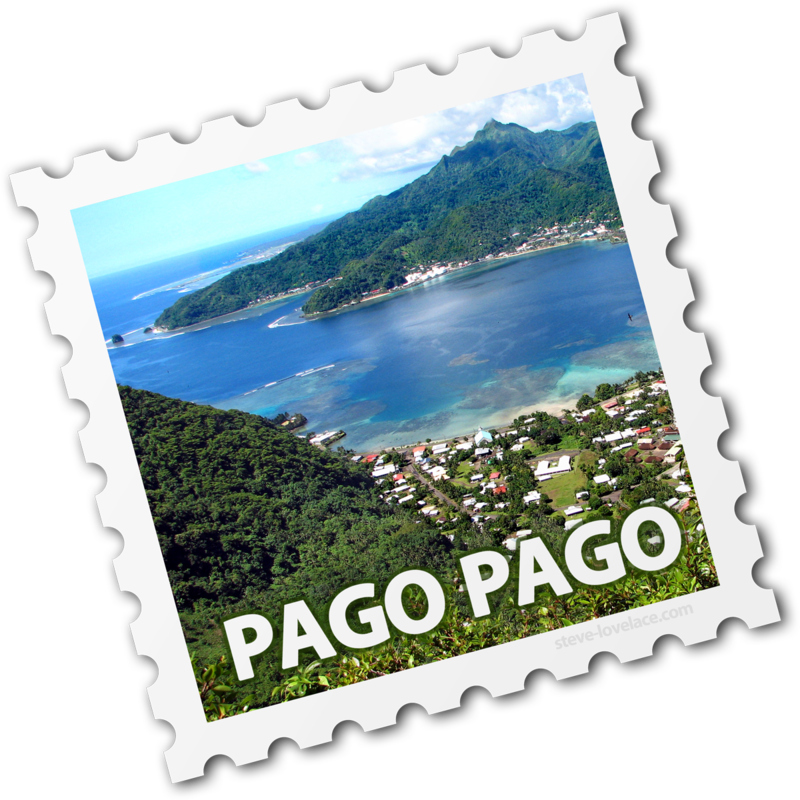 That’s when I discovered that most retailers don’t ship to Pago Pago. Some claim they do, but when it was time to check out, the only option was a $100+ FedEx or UPS shipment. And even if you clicked that option (out of curiosity), it would refuse to accept a PO Box address. Then there were the websites that wouldn’t tell you what shipping service they used. And then there were the sites whose online forms listed all 50 states, DC, Puerto Rico, Guam, US Virgin Islands, Northern Mariana Islands, military post offices and everywhere else under the US Flag. But not American Samoa. I could never be sure if this was a deliberate omission or simple ignorance on the web developers’ part. Despite the difficulties, I found retailers who would ship to the island for a reasonable price: Amazon, Old Navy and Starbucks. I was very excited when I found out that Starbucks shipped USPS to any state or territory for five dollars. I ordered a couple of pounds and waited. Normally packages to Samoa took at least six weeks, but my coffee arrived in just a month. It was damn good, better than anything I could have bought on-island. A few months later, I went online to order some more. Lo and behold, they had added a $15 surcharge for US territories. I was disappointed, but amused. It seems I caused a rule change. I’m guessing it cost Starbucks way more than five bucks to ship to Samoa. Someone there noticed, and they changed the rule because of me. Despite all the difficulties with the post office, both here and there, I was thankful to have the connection to the mainland US. Still, I’m happy now to live in a city where things don’t have to be shipped in on a boat. I was browsing the internet looking for Samoan Fabric and I came across your page. I enjoyed reading though. That is so true. I do not know why they never solve that problem I was visiting the island in 2007 and they were working on and I guessed not, huh? Thanks for posting this. It was very interesting. I have been to American Samoa twice. The last time was in 2011. I hope to go again soon. If I ever go again, I would bring you some Starbucks coffee. I am from Alaska Native. I Wanted to get my birth-certificate since i was born in american samoa at LBJ medical center and i wanted to know if i mailed all the necessary items is it possible to FEDEX my mail straight to the designated place in samoa or do i need to send it off priority mail thru regular postal mail? this is my first time mailing something to samoa and i wanted to make sure that im able to FEDEX to samoa as an easier route please let me know thanks. I can’t say for sure, but USPS is probably going to be more reliable than FedEx. That said, I’d see if anyone at LBJTMC knows for sure. I live here in Tutuila and yes there is FedEx here, however it’s through “CSL Cargo”. “Fax Cargo” handles UPS’s mail and there’s also “DHL” which is super expensive. The USPS here is just below average imho. I ordered a product with Amazon, it was scanned here in Dec 2016 but I never picked it up. To this day they have no answer for me as to who they gave my Amazon product (El Capitan OS start up disk) to. I also had another Amazon order (vitamin pills) returned to sender ’cause the local customs had a tip of a drug shipment trying to get on the island last year (2016). The USPS here is mostly ok, but they do have their hit/miss moments. Yes it’s best and probably the most expeditious way to send or receive something via USPS to Am. Samoa. The local post office uses Hawaiian Air to transport the mail to and from Honolulu, Hi. Hawaiian Air only flies in and out of Am. Samoa twice a week usually Mondays and Thursdays. Sometimes picking a parcel at the local post office can be an adventure to say the least but it’s still better or more expedient than having it shipped in. Welcome to the middle of the South Pacific. Patience and understanding are essential. Good luck! Hi Steve- I appreciate the article. I sent a package out to a friend in American Samoa and was not sure of the best way to ship it so I went with USPS…. I hope it makes there! Anyhow, in your opinion- what is the best coffee grown in America Samoa that you would recommend? I want my friend to send me some of possible. I read somewhere online that they grow excellent coffee.